The Canon Powershot Elph 300 HS is an improved version of the Canon SD940. It has been designed with the newest HS (High Sensitivity) technology, which includes a speedy image sensor and a luminous optical zoom lens. Other upgrades installed in the camera include; 5X zoom, 12 MP, 1080P HD video with image sensory, and new scene modes that can be applied to video captures as well! With all the new, innovative technology, you're bound to have a great time using the camera. 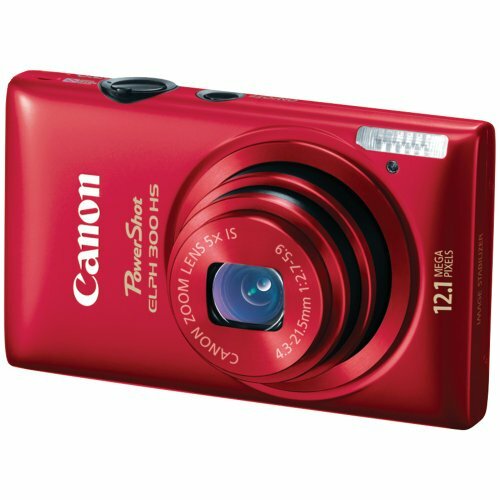 Not only does the Canon Powershot camera produce high quality photos and videos, it is also stylish. It's thin shape and sleek texture makes it ideal for today's modern world. Weighing just less than 5 ounces, the camera can also be easily stored and carried everywhere so that you are prepared to capture every special moment. You might have heard about Canon's HS System, but what exactly is it? Canon combines CMOS Sensor and DIGIC 4 Image Processor so that every shot is perfect. The CMOS Sensor makes sure that the shot is taken in the proper position in order to have the best light reception. The DIGIC 4 Image Processor is in charge of reducing background noise and making image processing quick. Photos and videos can be taken in low-light settings using the HS system. The best thing about this new feature is that you don't have to worry about using flash in order to get a great photo. Now you can let your camera do all of the work! Obtaining a high quality HD video has never been easier than this. With just a push of a button, the camera allows you to have the ultimate video capturing experience. Unlike other cameras, this one enables you to use the optical zoom without worrying about a shaky film. This is possible thanks to the dynamic image stabilization feature that is integrated into the camera. Slow Motion Video - Once you've captured a high speed video, you can go back and enjoy it in slow motion. Miniature Movie Mode - This gives you the option to convert large scene settings, such as a city, into miniature. Point and Shoot Movie Digest - With this feature, a photo can be taken as the camera continues to record the moment for 4 more seconds. In the end you'll have a compilation of the still photos and video clips. New Scene Modes - There are 2 new scene modes to choose from; Toy Camera Effect and Monochrome. The Toy Camera Effect makes the edges of a photo darker giving it a classical appearance. The Monochrome mode allows you to select from three distinct tones; blue, black and white, and sepia. Easy to Use - Despite of the camera's endless features, it's simple layout makes it easy to use. Excellent photo and video quality. Compact - The camera can fit in a purse, backpack, and even in your pockets! Currently, the Canon Elph 300 has a total rating of 4.2 stars out of 5 on Amazon. The majority of people that didn't give the camera a 5 star rating gave it a 4. About 336 people gave it a 5 star and 121 rated it with a 4. One person stated the following in an Amazon review: "The Powershot 300 HS has surpassed my expectations." surprisingly, the this camera is shed in an overall positve light. There is an endless list of reviews available online. In summary, the Canon Powershot Elph 300 HS is great for anybody for every day use. It can take close-up photos/videos, action snapshots, suitable for family snap shots, as well as more sophisticated shots while you are out and about on your vacation. Sounds like Canon are great cameras. I just bought the Canon Powershot SX50 HS and love it so I wrote a review on that one. Great information on your Canon.